Catholic News World : #BreakingNews Cardinal Zen New FULL TEXT Letter "...the Vatican is ready to surrender to the Chinese Communists"
#BreakingNews Cardinal Zen New FULL TEXT Letter "...the Vatican is ready to surrender to the Chinese Communists"
ASIANEWS: The bishop emeritus of Hong Kong comments on some statements and publications of the past few days, after the declaration of the Vatican press office on the "presumed difference of thought and action between the Holy Father and his collaborators in the Roman Curia on issues relating to China". The accusation of Card. Zen: the Letter of Benedict XVI to Chinese Catholics is only partially quoted. Comfort to the faithful of the underground communities forced "to enter the lion’s cage". Hong Kong (AsiaNews) - In a blog post published yesterday, Card. 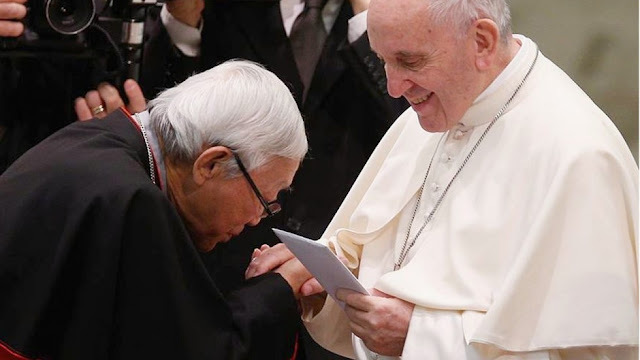 Joseph Zen returns to questions related to the possible agreement between China and the Vatican on illegitimate bishops replacing legitimate bishops, and on what he called the "selling-out" of the Chinese Church to the government of Beijing. FULL TEXT : Translation from Chinese by AsiaNews. Some people who care about me advised me not to speak more, or rather to pray more. Of course to pray more is absolutely correct, and all our hopes should be on God, and entrusted to the intercession of the Blessed Mother. Those who advised me not to speak more probably are concerned of me being easily attacked by others if talking too much. I am not afraid of that, only if I am sure that the words are fair and useful, then I am not afraid of the gains and losses, given my age. I still want to talk because I'm afraid I won't be able to speak any more soon. Please bear with me. The mainland brothers and sisters, in the past few days, have heard that the Vatican is ready to surrender to the Chinese Communists, their hearts are probably very uncomfortable. If the illicit and excommunicated bishops are to be legitimized, and the legitimate bishops are to be forced to retreat, wouldn't the legitimate bishops of the underground communities be worried about their fate? Priests and believers will soon have to obey and respect those who are today illicit and excommunicated but become legitimized bishops by the Holy See because of the backing by the Chinese government. How painful nights will they have to bear? No need to say tomorrow, but even today the great plague has begun. Since February 1, 2018 the Chinese government will strictly enforce the Religious Regulations. The underground priests of Shanghai have informed their Church members not to go to their Masses. Those who are stubborn and disobedient will probably be detained! Don't be afraid, God will heal the broken heart! The Secretary of State of the Holy See says: "We understand the pain of Chinese brothers and sisters yesterday and today." Alas! This man of little faith knows what real pain is?! Mainland brothers are not afraid of losing homes and properties, not afraid of being imprisoned, also not afraid of shedding blood. Their greatest pain is to be betrayed by their “closed ones”! Pope Francis also spoke to the Bishops in Asia at the Asian Youth Day, in South Korea: "The first condition of dialogue is coherence to one's own identity." Now that I have decided to give priority to truth and justice (all I am saying is to protect the pope's reputation and to clarify the Church's Truth), I also wish to tell you that I received a private audience with Pope Francis three years ago. It took me 40 minutes to report my views on the “dialogue”. The Pope listened to me for 40 minutes without interrupting me, only when I said, “The Church on the mainland is objectively speaking a schismatic one (independent and government-managed)”. The Pope said, “Of course!” (“Certo!”). Yesterday many people called to "comfort me" in person or by telephone because I was scolded by a spokesman for the Holy See. This is another big misunderstanding. I definitely do not need sympathy. Let us comfort the spokesman instead! He is a caged bird, forced into such an awkward position: this time he was so efficient, all at once criticized my speech (of course, written by others, he read out). However, not more than a year ago, before the Ninth National Assembly of the Catholic Representatives in China, did he not say “Holy See is waiting for hard facts before it makes a judgement”? (“La Santa Sede attende di giudicare in base a fatti comprovati.”）It is more than a year, and we are still waiting for that judgement! South China Morning Post commentator A. L. is also worthy of sympathy. Every day he has to find an object to criticize, to mock, and he is a learned person (he can talk about de omnibus et aliquibus aliis, all topics, and others.) In his the article that day, he said that I like politics more than religion. I want to remind him. “Where angels fear to tread, the fools rush in”. What does he know about religion? What is faith? He said that I decided to make the faithful of the Mainland to suffer. Does he know: what is the real pain for a man of faith? But his last remark was right: “The Vatican has to readjust its worldly diplomacy, whatever its spiritual preferences may be.” However, those are not just preferences, they are not-negotiable principles!